The fall time was a bit difficult for me. I had a horse, I had arenas, and trails for riding but I couldn't ride and I really wanted to! Fall is great trail riding here in the Midwest. However, I didn't like how my soft saddle fit on Gemma. It wiggled from side to side a wee bit, not a very secure feeling on the back of an 800lb animal that has a mind of her own. I found myself asking for advice in one of the horse training groups on Facebook. Everyone said ride her because you've been doing groundwork for several months now. Sounded good to my head but not so much to my gut. Something was picking at the back of my brain but I couldn't fully figure out what. So I set to thinking through the saddle thing. Then I recalled about my mom's forty plus year old saddle and how alike both Gemma and Sheeba are in build through out the shoulders and back. I was sure it would fit. Sheeba was my mom's mare that she had for thirty six years, she owned Sheeba's dam, so literally this mare only ever knew one owner. She was my mom's heart horse. I had the pleasure of learning to ride on this very special mare and she and I shared our own special connection. Consequently since the saddle was Sheeba's, it's also the one I learned how to ride in. Thus to say I was honered when my mom agreed to ship the saddle to me is and understatement. Trying on the saddle. The sheet was for picking up dirt pattern to help with visual for fit. It took her about a month to get it to me because it needed some TLC through oiling and a few repairs. It finally arrived the Tuesday before Thanksgiving. I went out the next day to put the saddle on Gemma to see if it would fit. As best I can tell it does and quite well too. So even though I had that little voice in the back of my head telling me I was an idiot for wanting to ride Gemma because she wasn't ready yet...I still decided to saddle up and see where we were at the next Tuesday. You think I spent the month waiting for the saddle doing a lot of little prep work for the ride? Nope. Why? As best as I can figure, because when I rode her in March things went well and she had been to a professional trainer the year before so she should be fine. Am I an idiot? Yup. In previous months I had done work with her on bending her neck with the rope halter and the lead rope tied around like reins. I guess I figured this was a good enough. Ha. All of the preparation with the rope halter as a bridle on the ground did not carry over to the saddle. She just locked her neck and went. I had no control or communication with her once I was on her back. After I got on, we stood for a couple before I asked her to walk. She did for a few steps then it was trot, canter, buck, gallop, and around we went for a good 10 - 15 minutes. 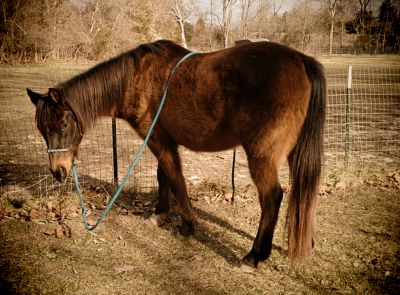 My late gelding, Cocoa, could buck good when he was young (he's who taught me how to ride them). Well, Gemma is better and that's saying something. The horn on the saddle was my life line that day. I am glad I have the experience I do or I would've kissed sand. Lost a stirrup during one bucking fit but was able to get back. Once she decided to take a breather and walk around I took my chance to turn her head. I'll admit I used force to do it but as soon as she softened I released. We did that for a several minutes at a walk. I was able to dialogue with her some finally. We stopped and backed up which she did awesome with. Then I got off. I then took her into the indoor arena and lunged her for a short while. Just enough to make sure she really was moving her feet freely for me. When we first started she didn't want to move so I smacked the flag on the ground firmly with the attitude of move it now. "Yes, ma'am" after that for the lunging session. I did lunge her before I got on but honestly is was a half hearted session on my part, I was too focused on riding. Thus when I stepped up on the mounting block the fact her head was up and her ears back didn't give me a good conscious clue that it probably wasn't a good idea to mount. Tunnel visioned idiot. After the ride and lunge but before tacking off. My friend who was there and watched agreed that it didn't look like Gemma was in pain but was pure attitude with the bucking and not listening. She moved out well in the saddle and it fits her well. So seriously, when your gut is telling you one thing and other people telling you another which agrees with your head, listen to your gut it will rarely lead you wrong. I could've gotten seriously hurt that day but thankfully I am a good enough rider (Thank you God for protecting me) and I was able to stick with Gemma through her fit. I wish I could've gotten her out of it before she 'tired' but it took all my skill just to keep up with her so not falling off became my number one priority. My left hand sported a very painful bruise for a couple of weeks as a result from clinging to the horn and I suffered some very sore muscles for a good week and some change. A lesson was definitely learned that day and many mistakes on my part which I don't intend to repeat.